Quantitative Poker: WSOP Utility Analysis revisited, part 1: How much of an edge is necessary to overcome tax and utility effects in the WSOP Main Event? WSOP Utility Analysis revisited, part 1: How much of an edge is necessary to overcome tax and utility effects in the WSOP Main Event? A few months ago, I looked at the true costs of playing the WSOP Main Event for the typical player after adjusting for the effects of tax and risk aversion. It's worth a read if you missed it. Overall, we found that there are significant tax and utility effects that a player must overcome, and thus that there is significant extra effective rake in playing the event. Exactly how much of a skill advantage does a prospective WSOP Main Event player need in order to overcome this effective rake? Can we... quantify it? The old model was built on the assumption that the average player was equally likely to finish in any of the 7,319 places in the tournament. To allow for our player in question to have a level of skill different from that of the rest of the field, we need a way to map player skill to a specific finish probability distribution, a specification for the probabilities of finishing in each of the 7,319 different places. If we generalize our scope to a tournament with N players, then we know that, when all players are equally skilled, each player will finish in each place with probability 1/N, as we've stuck to in the old model. If a specific player has a different strategy than the other players (whom we will assume to all still be uniformly skilled), then what does his finish probability distribution look like? We quantify skill through the typical tournament results convention of raw ROI, which we define as the player's pure return on investment in the absence of tax and utility considerations, but including the rake. For example, in the WSOP main event, since $600 of the $10,000 entry fee goes to rake, the average player's raw ROI is -6%. This is ROI as it is commonly used in discussions and in tracking software; we add "raw" to convey that it is in pure dollar terms, without utility or tax effects. Since this is the measure of skill edge that is commonly used, it is desirable for us to define our correspondence between player strategy and finish probability distribution by creating a mapping between raw ROI and a probability distribution. However, there is no reason that the increasing increments between each place should be equal throughout the entire distribution, as they are here. Our simple guess may not approximate reality very well. There's also another problem with this family of distributions: it turns out that we can't capture every possible ROI (from -100% to a certain 1st place) through this type of distribution. Note that this model, as well as all of the forthcoming models, produces the desired result of uniform probabilities of 1/N when we set the player's skill to zero. This is again an increasing distribution, and one that should make sense for a bona fide heads-up tournament with 2^k players, but other than that, there is no intuition as to how it might apply to a non-heads-up tournament. A superior player's skill edge in a tournament could be approximated in a model that removes his strategic advantage but instead gives him a larger starting chip stack. See The Mathematics of Poker for a discussion of other methods of tournament chip stack valuation; it seems that Malmuth-Weitzman is the only reasonable competing theory to ICM out there, and it only differs from ICM in how a busted player's chips are distributed among the remaining players on average. I haven't spent too much time thinking about the differences between these models. My understanding is that each of them diverges from real historical tournament results, though I do not know if anybody has analyzed this rigorously. The hard part's done! Now we can just take this parameterized finish probability distribution and plug it into our good old WSOP Main Event expected utility analysis and see what we get. We see that, under this model, the relationship between the CE payoff and the player's raw ROI is close to linear. Examining the data confirms that this visual intuition is accurate. In particular, we see that, for our typical player ($80k net worth, $50k income with at least $10k from poker, risk aversion of 0.8), the ROI needed to simply break even after tax and utility considerations is 86%. 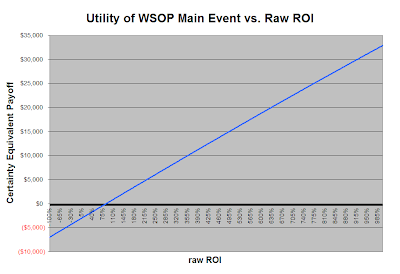 So that answers the question we were left with when we first looked at expected utility analysis for the WSOP Main Event. After correcting for tax effects and risk aversion, the typical player needs to have a raw ROI of 86% in order to break even in certainty equivalent by playing the WSOP Main Event. Having higher net worth helps alleviate this high threshold. A player with a net worth of $500,000 and a YTD salary of $100,000 needs a 42% ROI to break even. A player with a net worth of $5,000,000 and a YTD salary of $1,000,000 needs only a 7% ROI. Again, we see that the WSOP Main Event is best suited towards the wealthy, despite its "everyman" appeal... though it is precisely the fact that the event appeals to so many everymen that causes the risk to be too great for them. Being less naturally risk-averse also brings down this threshold. The typical player with $80,000 net worth and a YTD salary of $50,000 needs only a 61% ROI if we reduce his ρ from 0.8 to 0.5. Further reducing ρ to 0.2 still leaves him needing a 33% ROI. Reducing it all the way to 0 (i.e. no risk-aversion, and utility is realized on the full amount of dollars remaining after taxes) brings it down to a 11% ROI. Risk aversion is demanding a higher minimum skill level than tax effects are. That's all for today, since building the finish probability distribution took so long. But now that the hard part's out of the way, we can play around with our expanded model in some other practical ways. For now, knowing that a player with typical risk aversion and tax effects will need to have a pure expectation of $8,600 in the WSOP Main Event is a pretty valuable baseline that can guide decisions. This again illustrates how the large field size and high buyin of the WSOP Main Event effectively crowds out the average player form participating — unless that player is willing to pay a high effective cost. But what if the player could reduce the size of the buyin for this event? Next time, I look at the possibility of the player being able to sell off some of his action at 1-to-1 (i.e. no markup), which effectively reduces the buyin from $10,000 to something more manageable for less wealthy players. Indeed, doing this can change an unprofitable opportunity into a profitable opportunity for the risk-averse tournament player. 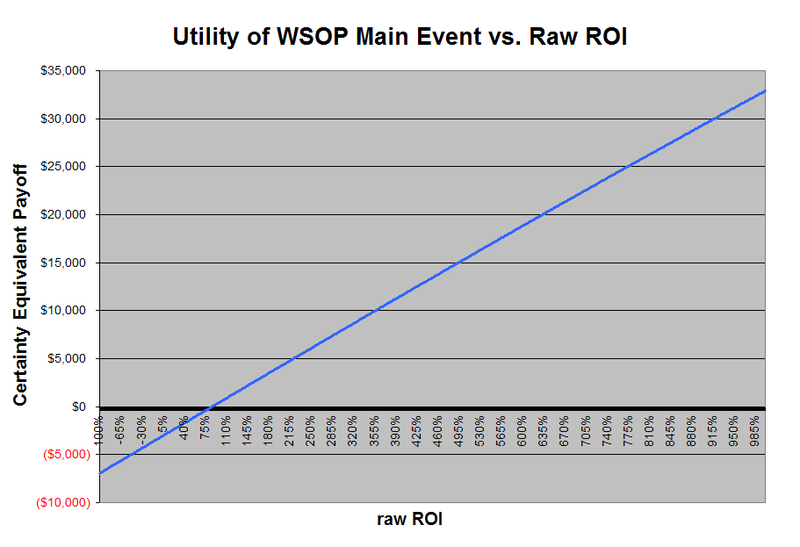 For different levels of raw ROI, we will solve for optimal percentages of one's action to take in the idealized WSOP Main Event. This should be valuable information not only for prospective tournament players, but also those that might buy shares in them. Stay tuned. I just read this now after reading your bubble post on pokerfuse. I must say that your second method approximates "The Theory of Doubling Up" describes in the "Mathematics of poker". So as long as you don't see it as you moving up half the spots, but the chips actually doubling, this distribution becomes smooth. Skill can be accounted for by that doublin-up probability, you have an edge if is larger than 0.5. ICM, ie Malmuth Harville is only important in the later stages of the tournament, imo, so it would be computationally prudent to not include them until the bubble has burst. I've been meaning to do a similar blog post on this, truly evaluating the ICM of the Nov 9, ie the question - when would you NOT take 2nd 3rd, 4th place money assuming a premium on 1st for sponshorship, etc. I also heard on a podcast that Devo says you make a Main event final table every 2 lifetimes, assuming you are skilled and play 30 Main Events over your lifetime. :) Maybe some weekend haha. Bellatrix, great to hear from you! Indeed, the second method here uses a similar model as the Theory of Doubling Up. I realized that it becomes a smooth distribution when looking at it as doubling chips instead of beating a heads-up opponent, but I wasn't sure how it would generalize beyond that when going from a heads-up tournament structure to a multiplayer structure. Notably, you will no longer be facing a single opponent with the same initial starting stack as you, as you would in a heads-up tournament. If you win a heads-up match against a field of uniform opponents with probability 0.6, you may not win a 4-handed shootout against the same opponents with probability exactly 0.36. You raise an interesting point with the observation that Malmuth Harville is more accurate later in a tournament. I haven't fully considered the implications, but they may be different than what I'm trying to build here. It may be the case that, in practice, the Theory of Doubling Up is a better model early on to value actual tournament chip stacks, and that Malmuth Harville is better later. But buildling a finish probability distribution is different than trying to find a way to value all chip stacks. It may even be a sub-problem of the chip stack valuation problem. With that in mind, any method that produces a finish probability distribution with desirable properties should be good. In particular, what I'm building here is something that should work independently of prize structure, which is of course a crucial component of chip stack evaluation problems. Thanks for the idea, I definitely need to think about the implications more. And I'm long overdue for a reread of Chen/Ankenman. Yours sounds like an interesting article idea, a utility-based approach seems to be a good way to approach that sort of question. It would certainly be a fun problem to play around with, I look forward to reading it if you find the time! Final tabling a Main Event once ever 2 lifetimes seems about right... if everyone were equally skilled, playing a 6,000-person field 60 times would only yield at least one final table with probability 9/6000*60 = 0.09, right? You'd have to be 10x more likely than average to make the final table before your mean number of tournaments would be down to 60ish, which seems plausible for an expert.